I just signed up for the 2019 European Challenge. Thanks so much for reminding me that there was still time to sign up. I simply loved, loved, loved Hotel du Lac. It spoke to me, on a very deep level. It was one of my three favorite books in the year that I read it. (2011?? Think so.) I resonated and resonated. I believe it is a true classic. I also looked up one of your books set in Austria--The Exiles Return. I have heard lately, in an article I read recently, how profoundly anti-Semitic Vienna, and indeed all of Austria was in the post-war period. That goes for all of central Europe, I'm sorry to say. But I looked up a review from the Jewish Book Council and I've got to add it to my list of books to read. How did you come across it? I'm also going to look up the Stefan Zweig novel. The Exiles Return was a Persephone reprint -- I'm a huge fan of their books and I've read more than half of their backlist so far. I don't think I would have heard of it if they hadn't reprinted it. Great list. You have a good mix of stuff I have heard of along with titles that are new to me. I really loved the Elena Ferrante Neapolitan series but they seem to be marmite books. People either love 'em or hate 'em. I just read Buddenbrooks last year and liked it quite a bit. I want to read The Magic Mountain now too. Hotel du Lac I adored but I hated all the other books by Brookner that I tried (shhhh, don't tell Thomas at Hoggelstock!). I tried reading the first Ferrante a couple of years ago and got stuck, but my book group is reading it in a couple of months, plus I've saved the whole HBO series on the DVR. I thought Buddenbrooks would be appropriate as I'm living here in Germany. I've only read one Brookner so far which I pretty much liked. Maybe Brookner is a Marmite writer? Glad you signed up for this challenge, too! Your tentative list looks fun & I'm looking forward to seeing the reports...I'll second the recommendation for Ferrante's Neapolitan novels--I was in love 'em category myself. Buddenbrooks I found great, and Judith Hearne, grim but also really good. But I'm particularly curious to hear about the Westcott, the Zweig, and the Marai. Several on my list are NYRB classics which my library has on digital download, which is where I found the Westcott and Marai. They also have the Zweig, though I own a print copy. Sometimes having it on digital makes me choose a book strictly for convenience when I'm traveling (which is why I end up not reading my owned books, as it's one less thing to carry). What a great selection of books! Thanks for joining the 2019 challenge! 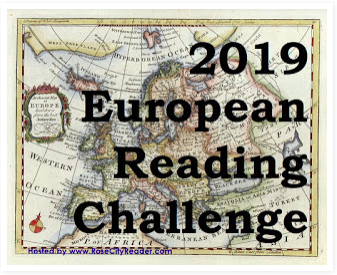 Yes, I'm joining the challenge too for the reasons you've mentioned; mostly the fact that my current tbr list contains quite a few already. You have some really interesting looking selections, and I'll look forward to your reviews. I did read Crime and Punishment last year, which was quite intriguing, as we'd expect from Dostoevsky.